A few years ago at college nationals, another coach asked me how we got our KU girls to stunt so clean. I’d seen his team’s routine, and they threw some great stuff, but he was right that even though they hit, they looked a bit rough. What was the difference? How can two teams hit, but one somehow looks better? First, all objects – including people – have a “center of gravity” (shown by the red dots below) which is the central point where gravity (dashed red line) is pulling down on you. When you’re standing still, your center of gravity is a few inches inside your belly button. But repositioning your limbs, head, or chest moves your center of gravity – even to outside your body. Second, every non-floating object also has a “base of support” (the green squares below), which is the mid-point of every part of you that’s touching the ground (or the bases’ hands). Here’s the basics of a person’s center of gravity and how it moves based on their limb, head, and chest position. The diagram above shows simple cases. 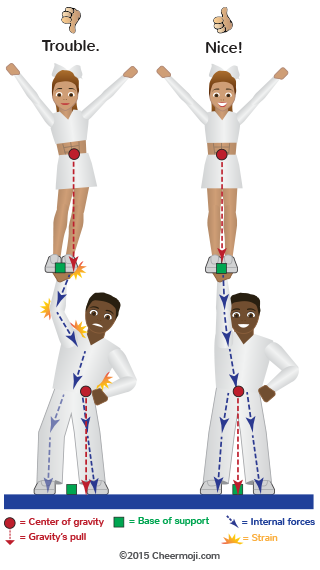 But with stunting, even small non-vertical lines shift the center of gravity, often to the toes or side of the foot, forcing the bases to move to save the stunt. 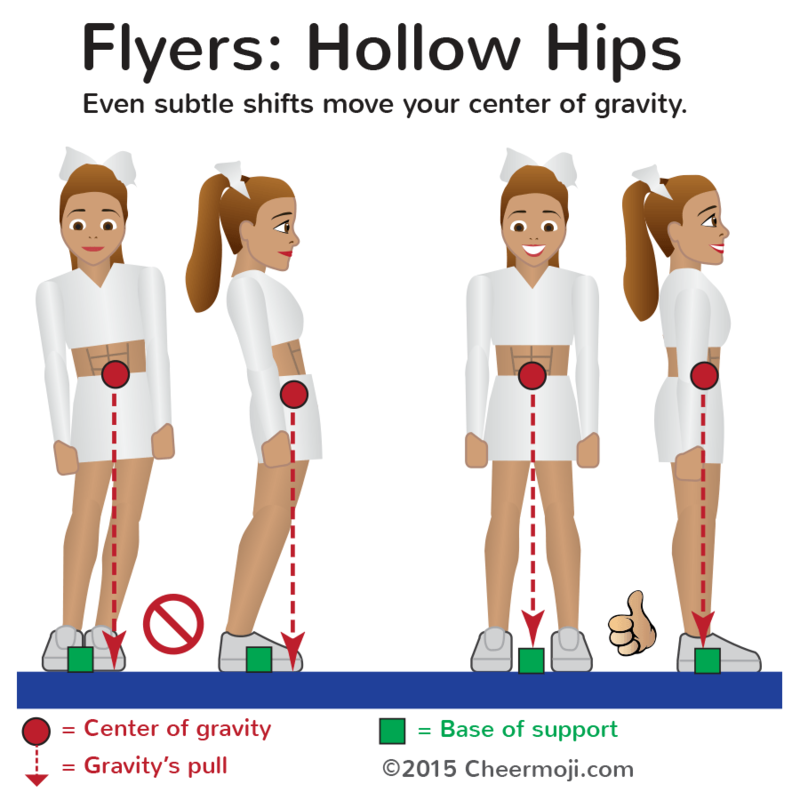 This is another reason why flyers should “stunt still,” because every bobble and balance adjustment moves their center of gravity, making it harder for bases to stay under it. Lastly, your body is like a chain of bones. If the bones aren’t vertically aligned, gravity pulls down on them from different points, causing your muscles to strain (shown in yellow) to fight against your bones’ non-vertical internal forces (the blue dashed lines). For flyers, that means things feel funky on the bases due to “torque” (which we won’t go into :). 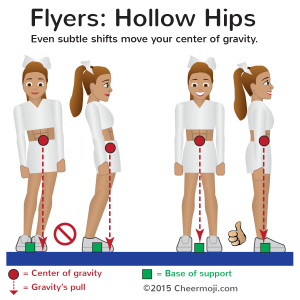 For bases, it means your muscles must work harder to hold the flyer, which is more tiring, less reliable, and increases the risk of joint injury. Stunt with your bones, not your muscles. Non-vertical body lines cause all sorts of janky internal forces on your body parts, making it harder to hold the stunt. 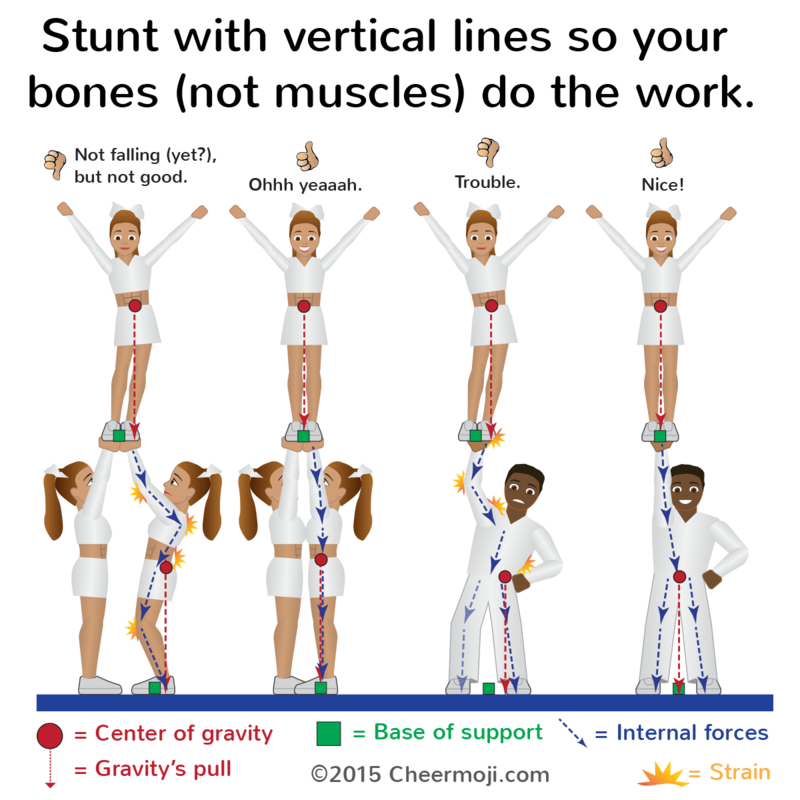 Non-vertical body lines hurt in coed stunting even more because the base of support is narrower and there’s only one person to absorb the janky forces. These keys are the building blocks of great stunting (pyramids too!). It gets a little more complicated with flipping and spinning, but focusing on vertical lines in the landing and catch will increase your chance of hitting. If you liked this post, sign up for these cheer and coach tips by email. Thanks!